The free DevDocs site offers a single dashboard for developers to scour through any language they choose. From the basics of HTML5 and CSS3 to complex server technologies like Apache and even frontend libraries such as Angular, it’s all here, in one handy location. There are literally hundreds of technologies listed and you can search to find whatever you want. Most are disabled by default to save on HTTP requests but you can enable them at the click of a button to get full access to all documentation. This website is constantly being updated with new features and new frameworks/developer APIs. It’s by far the most comprehensive list of programming documentation on the web, all curated into one easy-to-read interface. And, did I mention this thing has mobile support and offline mode, too? You can enable all the docs you’ll need, then go offline and still have full access to everything. Not to mention it has a free Chrome plugin for adding DevDocs right to your browser. No question this project is one of the largest out there and it’s really a great tool for developers. Once you’ve added an API to your dashboard, you can browse through examples of code snippets & proper implementations for common features. 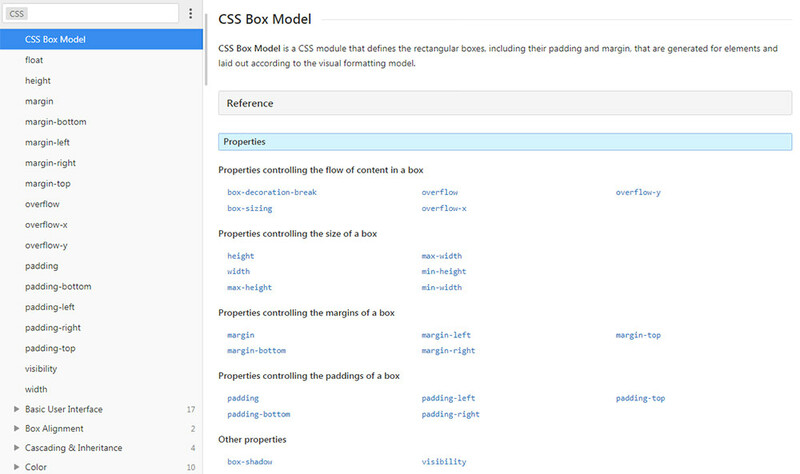 For example, the box model page covers everything about the CSS box model, with links to individual properties and beginner tutorials. When you get to more complex stuff such as Laravel or Rails, you can look up functions to get a list of all the options, possible default values, and how to handle return values. DevDocs isn’t just a site for front-end developers. It’s a site for all programmers building web apps, native mobile apps, video games, desktop software, literally anything. Take a peek at the homepage and give it a shot. You may still prefer the native documentation for whatever language/framework you’re using but it doesn’t hurt to have it all compiled in one place. And, the project is open-sourced on GitHub, so it has plenty of contributions from pro developers all over the world. Definitely, a valuable resource for anyone who spends a lot of time coding and wants to improve their workflow. If you have suggestions for new languages or improvements you can also drop a message to the official Twitter account @DevDocs.